The Snappli service has been discontinued. 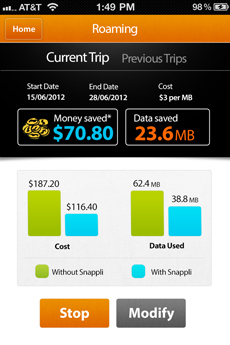 Please follow the link below to remove Snappli from your mobile device. Cut your mobile data costs, including video, by up to 85%. Avoid throttling and prevent overage fees. 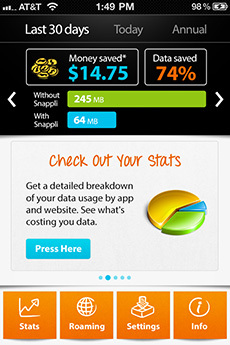 You get more out of your data plan, whether it’s contract or pay-as-you-go. Speed boost gives you faster access to your apps and webpages. Waste less time waiting for stuff to download. Minimize data roaming charges when using your smartphone overseas. Now you can really use your smartphone anywhere. Explore the mobile web securely using your data network with 24/7 protection against harmful websites and links. 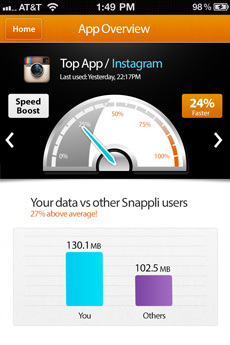 Track your usage by app and find out which apps are hogging the most data. 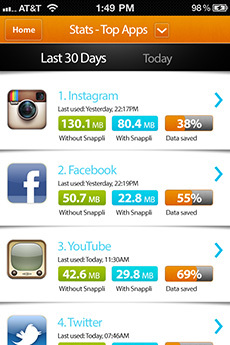 Downloading Snappli is a no-brainer - especially if you accidentally go over your data allowance each month. It's easy to use, free and genuinely can save you money. ★★★★ Great for viewing videos over a 3G connection and maximising your monthly allowance. GigaOm recognizes Snappli as one of the most-promising mobile startups of 2012. Wonga Future 50 on Snappli: "If you're looking for big ideas that will create and change markets, it's a shoo-in." Finalist for Mobile Business of the Year & finalist for Innovative Business of the Year. Send us your ideas, questions, feedback, partnership and press enquiries. We’re looking forward to hearing from you.